We are committed to educating our patients about their dental needs so that they can make well-informed decisions about their treatment plans. We practice conservative dentistry, meaning that we recommend treatments that save or enhance your natural teeth. We also want our patients to be active participants in their oral health, so we never start treatment without explaining your treatment plan, answering all of your questions, and having your consent. We deliver our services with honesty and integrity, and provide our patients with state-of-the-art technology and techniques for more effective dental visits. At Advanced Care Dentistry & Dentures, we truly believe you and your oral health are unique; we want to be your partner on your quest to long-term dental health. Dr. Hoang and Dr. Vo want your visit to Advanced Care Dentistry & Dentures to run as smoothly as possible. To help expedite the check-in process, you can download, print, and fill out our new patient forms before you arrive at our office. If you are unable to fill out the forms before your appointment, please arrive 15 minutes early. Thank you for helping us stay on schedule! Save Time on Your First Visit! The field of dentistry has had so many advancements over the last few years. New technologies and techniques allow us to make your exams more comfortable, your treatments more accurate and effective, and your time with us more enjoyable. We invest in state-of-the art technology and continuing education because we believe you deserve outstanding dental care! Digital X-rays are a unique technology that allows us to quickly and comfortably take digital scans of your mouth. Remember the old X-rays and the uncomfortable plastic you had to bite down on? Those are things of the past! Digital X-rays give us high-quality images that are viewable within seconds. Because the images are digital, we are able to view them on the computer, resize them so we can enlarge any areas of concern, and save them for reference in the future. Plus, digital X-rays emit up to 90% less radiation than conventional X-rays! 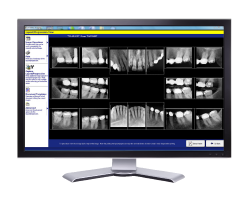 Digital panoramic X-rays are two-dimensional dental X-rays that capture the entire mouth (teeth, upper and lower jaw, and surrounding structures and tissues) in just one image! This image gives Dr. Hoang and Dr. Vo detailed images of your bones and teeth so that they can come up with very precise and accurate treatment plans. We know that sometimes when we are examining your mouth, you may feel like you don't know what is going on or what exactly we are looking at during the exam. But with our intraoral camera, you can see exactly what we see while we are examining your mouth. We take digital pictures of your teeth and gums with our intraoral camera and then put the images up on our overhead TV. We can then thoroughly walk you through your exam and show you any areas of concern. Our intraoral camera helps you become an active participant in your dental visits.